GvHD represents a unique immunopathological process induced by interaction of alloreactive T-lymphocytes with distinct target tissues. Nonimmunological factors are involved as well. GvHD affects many organs such as the skin, liver, and GIT and sometimes runs a devastating or even lethal course. GvHD may develop in different clinical settings such as blood transfusion, MFT, DLI, or SOT. However, most often it is observed as a complication of allogeneic BMT or PBSCT. 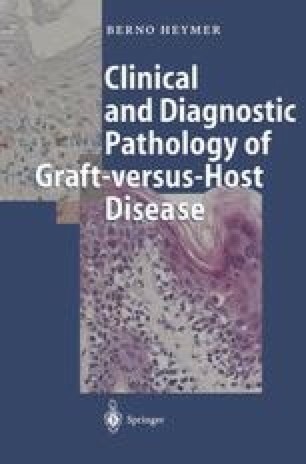 In the latter case the histomorphology of lesions can be modified considerably by GvHD prophylaxis or treatment. This must be taken into account when analyzing the clinical and diagnostic pathology of GvHD today.